Trinidad All Stars - Me and Meh Lady. 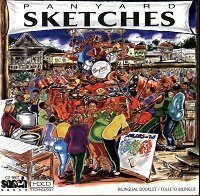 The 1998 Panorama Finalists Playing recorded in their Panyards. Sanch's High Definition Compatible Digital process recordings bring you steelband music like you have never heard it before. Eight tracks with 64 minutes of the essence of steelband music.